Cheltenham is a residential suburb 18 km south-east of Melbourne adjoining the bayside suburbs of Beaumaris and Mentone. Its name came from the Cheltenham Inn, opened by Charles Whorral from Cheltenham, Gloustershire, England, in 1853 in the place known as Two Acre Village (1852). The land-owner, Josiah Holloway, who subdivided the land into two-acre lots formed a northwards track, now Chesterville Road, from the Brighton Road (now Nepean Highway). The intersection of these two routes formed the nucleus of Cheltenham. Anglican and Wesleyan schools were opened in 1854 and 1855 respectively, the Anglican one serving as a place of worship until 1876.The Anglican school was about 700 metres east of the present day township. Today it is the Cheltenham East primary school. The Anglican church built in 1867 is in the township where the main roads intersect and where in 1881 the railway line was opened. The Uniting and Presbyterian churches, the Old Cheltenham Cemetery and the Cheltenham primary school are also in the township. A little south in Glebe Avenue there was the most reliable of several springs in the area. 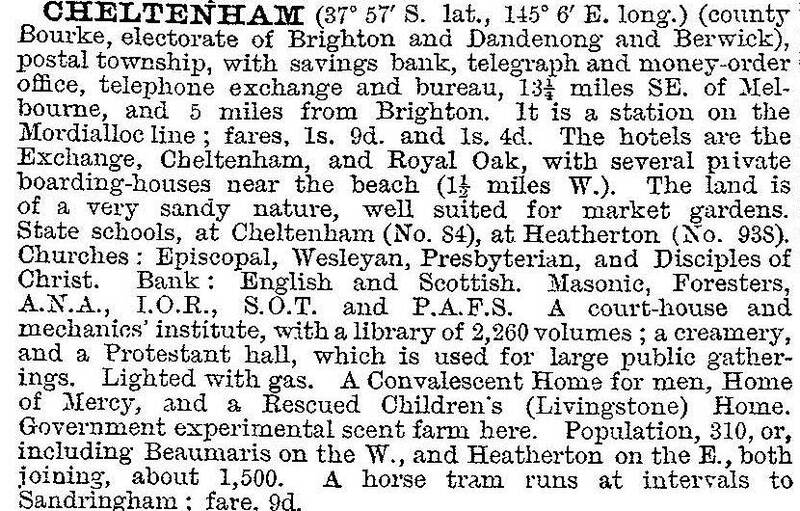 By 1865 Cheltenham had two hotels, a mechanics' institute, a post office and coach or omnibus services to Brighton, Mornington and Melbourne. The lightly timbered and grassed countryside was much cultivated by farmers and market gardeners, and the district's estimated population was 250 persons. For a short time the mechanics’ institute was the home of a Church of Christ which had begun in about 1859 at the corner of Chesterville and Wickham Roads. In 1878 the church built a brick chapel closer to the village, in Chesterville Road just north of Nepean Highway. The chapel is included in the present church. During the 1950s and 1960s the market gardens were filled with housing and manufacturing activities. Primary schools at east and west Cheltenham were opened in 1956 and 1957, and a high school three years later. In 1968 Myer opened its Southland drive-in shopping centre, about 500 metres north of the township across the Nepean Highway, on the 27 acre site originally occupied by Livingstone House and taken over by the Catholic church in the 1950s for a boys’ home. By 1995 Southland had 63,000 square metres of gross lettable area. The Lucas Batteries factory site was acquired for the expansion of Southland across the Nepean Highway in 1999. The state government committed to building a new railway station at Southland shopping centre to be open by 2016.